2.00 Ct Oval Cut Diamond Bezel Set Women's Engagement Ring 14k Yellow Gold over. The design will amaze you and the Sparkle will dazzle you! Finish: Platinum. Style: Trilogy Three Stone. Center Stone Weight: 1.00 Carats. Cut: Round Brilliant. When Only the Best Will Do. Ring has a total carat weight (TCW) of 3.00 TCW. Everything is beautifully set in an 925 sterling silver. Ring has a total carat weight (TCW) of 2.50 TCW. Everything is beautifully set in an 925 sterling silver. Ring has a total carat weight (TCW) of 3.50 TCW. Everything is beautifully set in an 925 sterling silver. Color Stones Change (White Topaz, Blue Sapphire, etc). Swarovski Diamond's excellent cut is equal to ideal cut diamonds, the best cut for reflection and loop clean. STYLE: Solitaire With Accents. Dispersion or "Fire" (Sparkle). WE CLEARLY REPRESENT WHAT THE ITEM IS MADE OF IN OUR ITEM SPECIFIC SECTION. If you have not received an answer it is simply because we are making an effort to get the answer for you ! You do not have to wait for us to send an Invoice. Ring has a total carat weight (TCW) of 4.00 TCW. Everything is beautifully set in an 925 sterling silver. Color Stones Change (White Topaz, Blue Sapphire, etc). STYLE: Solitaire With Accents. Dispersion or "Fire" (Sparkle). Swarovski Diamond's excellent cut is equal to ideal cut diamonds, the best cut for reflection and loop clean. Color Stones Change (White Topaz, Blue Sapphire, etc). DIAMOND SHAPE: Princess & Round. STYLE: Solitaire With Accents. Swarovski Diamond's excellent cut is equal to ideal cut diamonds, the best cut for reflection and loop clean. 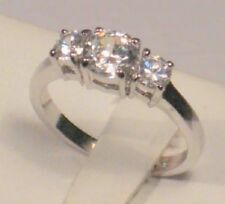 3 Carat Classic AAA Lab-Created Diamond Princess Square cut 2pc Bridal Ring Set, Ladies size 9. Gorgeous modern set, adorned with a sparkling 6mm, 1CT Princess cut center & Princess cut accents. Our Sterling Jewelry is made in the USA, Rhodium plated and will not turn finger green. WE CLEARLY REPRESENT WHAT THE ITEM IS MADE OF IN OUR ITEM SPECIFIC SECTION. In addition to our wholesale brick and mortar outlet in USA, we have a considerable online presence. You do not have to wait for us to send an Invoice. Ring has a total carat weight (TCW) of 3.25 TCW. Everything is beautifully set in an 925 sterling silver. WE CLEARLY REPRESENT WHAT THE ITEM IS MADE OF IN OUR ITEM SPECIFIC SECTION. In addition to our wholesale brick and mortar outlet in USA, we have a considerable online presence. If you have not received an answer it is simply because we are making an effort to get the answer for you ! 10k White Gold Over. Diamond Shape Pear. Note : All Designs Are computer generated designs. Original Product Might look little different than this. This solid handmade ring is perfect gift for the significant other, or special best friend, they can wear it as wedding rings or to complete their formal or casual wear, The joy of a handmade ring is it's unique design, and it makes an interesting conversation piece. We can manufacture Silver with Diamonds products as well as Silver-Lab Created Diamond products with equal ease. We turnaround 1,00,000 pcs annually. We keep you updated regarding the status of your order. 10k White Gold Over. Diamond Shape Cushion. Note : All Designs Are computer generated designs. Original Product Might look little different than this. This solid handmade ring is perfect gift for the significant other, or special best friend, they can wear it as wedding rings or to complete their formal or casual wear, The joy of a handmade ring is it's unique design, and it makes an interesting conversation piece. Ring has a total carat weight (TCW) of 5.00 TCW. Everything is beautifully set in an 925 sterling silver. Clarity VVS1. Style Solitaire. Main Stone Shape Princess. Main Stone Simulated Diamond. Diamond Color D. Country/Region of Manufacture United States. Ring Size 5, 6, 7, 8, 9, 10, 11, 12 & All Middle Size Available. Ring has a total carat weight (TCW) of 2.25 TCW. Everything is beautifully set in an 925 sterling silver. Color Stones Change (White Topaz, Blue Sapphire, etc). DIAMOND SHAPE: Princess & Round. STYLE: Solitaire With Accents. Dispersion or "Fire" (Sparkle). Swarovski Diamond's excellent cut is equal to ideal cut diamonds, the best cut for reflection and loop clean. Dual Halo Ring. Radiant Shape. Signity Diamond's are bright white man made diamonds with more sparkle than natural diamonds. 14K White Gold Over. They are bright and sparkly and display more fire than the best grade of diamonds as shown in the table below. We can manufacture Silver with Diamonds products as well as Silver-Lab Created Diamond products with equal ease. We turnaround 1,00,000 pcs annually. It is that simple! We keep you updated regarding the status of your order.